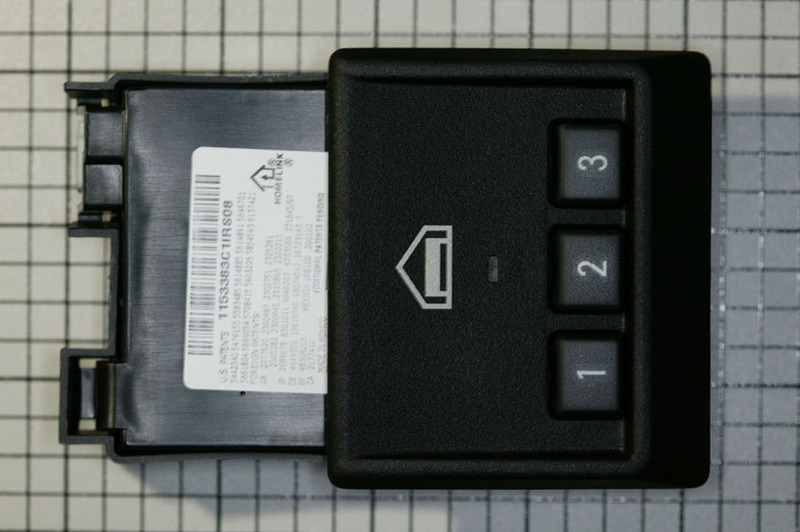 The following DIY documents the procedure to modify a BMW Universal Garage Door Opener (UGDO) to be waterproof and to install it in the Atom. Do not use this DIY unless you are familiar with basic automotive repair procedures and safe workshop practices. This DIY illustrates the workskop procedures required for the specific subject being documented in the DIY. It is not a substitute for full and up-to-date information from the engine and vehicle manufacturers, nor is it a substitute for proper training as an automotive technician. Note that it is not possible for me to anticipate all of the ways or conditions under which vehicles may be serviced or to provide cautions as to all of the possible hazards that may result. The engine and vehicle manufacturers may continue to make changes, issue service information updates and parts retrofits after this DIY has been published. Some of these updates and retrofits will apply to procedures and specifications in this DIY. I have endeavored to ensure the accuracy of the information in this DIY. Please note, however, that I cannot warrant the accuracy or completeness of the information contained in this DIY. FOR THESE REASONS, I DO NOT MAKE ANY WARRANTIES, EXPRESS OR IMPLIED, THAT THE INFORMATION IN THIS DIY IS FREE OF ERRORS OR OMISSIONS, AND I EXPRESSLY DISCLAIM THE IMPLIED WARRANTIES OF MERCHANTABILITY AND OF FITNESS FOR A PARTICULAR PURPOSE, EVEN IF I HAVE BEEN ADVISED OF A PARTICULAR PURPOSE, AND EVEN IF A PARTICULAR PURPOSE IS INDICATED IN THE DIY. I ALSO DISCLAIM ALL LIABILITY FOR DIRECT, INDIRECT, INCIDENTAL OR CONSEQUENTIAL DAMAGES THAT RESULT FROM ANY USE OF THE EXAMPLES, INSTRUCTIONS, OR OTHER INFORMATION IN THIS DIY. Your common sense and good judgement are crucial to safe and successful service work. Read procedures thoroughly before starting them. Think about whether the condition of your car, your level of mechanical skill, or your level of reading comprehension might result in or contribute in some way to an occurrence which might cause you injury, damage your car, or result in an unsafe repair. If you have doubts for these or other reasons about your ability to perform safe repair work on your car, have the work done at a qualified repair shop. Now that that's out of the way, let's get started. 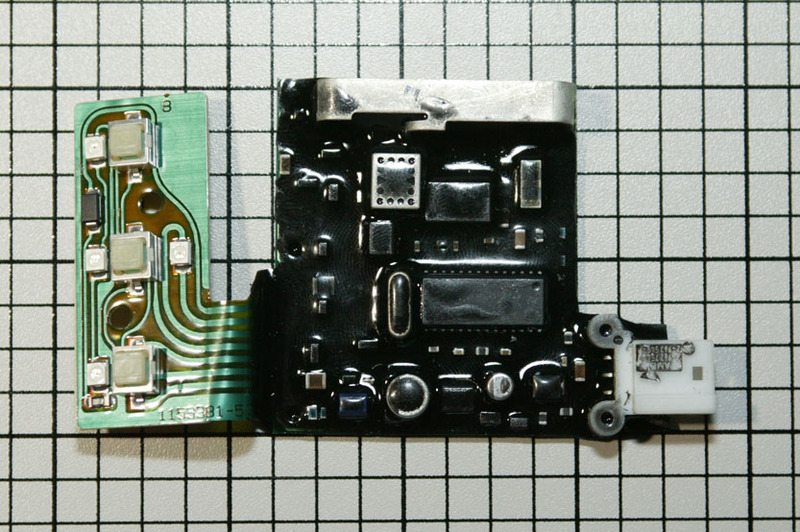 Note that this DIY involves making changes to an expensive ($150+) piece of electronic equipment, and if you're not careful you can ruin it beyond repair. So, please review the entire DIY before deciding to undertake this project. This is what the completed installation looks like. 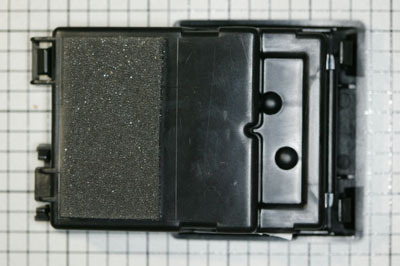 The opener is located toward the rear of the center console assembly. 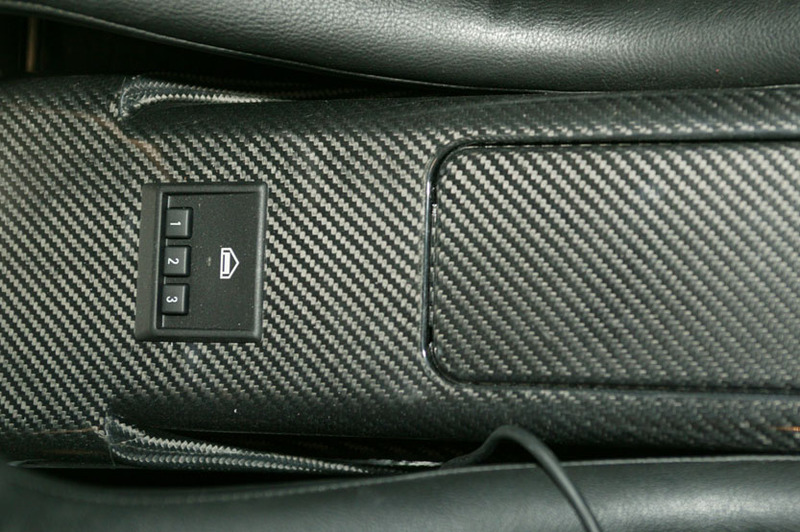 In this area it will get wet if you drive your Atom in the rain, and since it was designed to be used in the inside of a BMW, it definitely isn't waterproof. So we'll need to modify the device to waterproof it. The wire at the lower edge of this picture is the cable for the passenger-side Autocom intercom. Of course, you could just use the remote that came with your garage door, but you need to find a place to store it so it won't get stolen or lost, and if you have more than one garage that you park your Atom in (as I do), the openers will quickly become a nuisance. 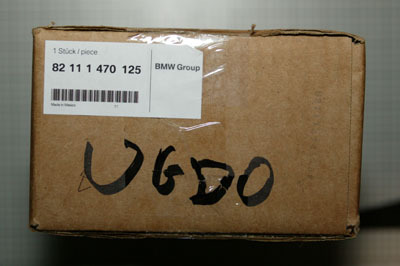 This is the box the UGDO comes in if you purchase it new from BMW. If you purchase a used one, perhaps from eBay, make sure that it is the newer style that supports "rolling codes", otherwise it may not work with your garage door. 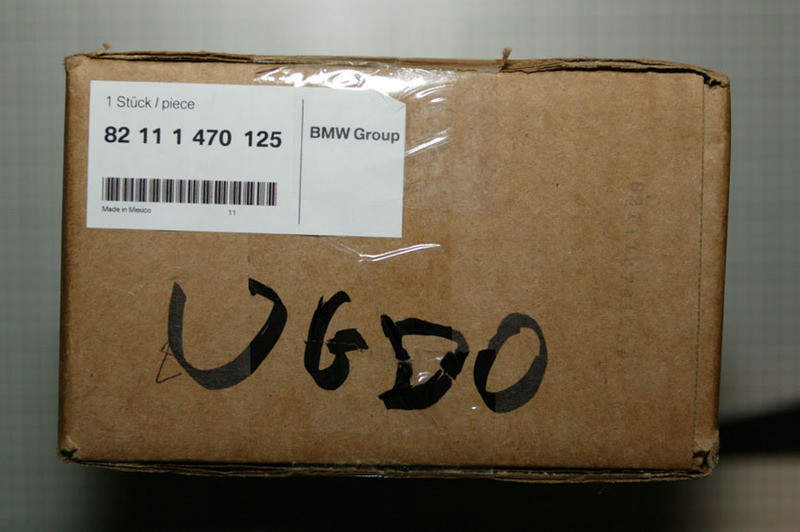 This is what the UGDO looks like when you unpack it. Regardless of whether you purchased a new or used one, this would be a good time to test it (see the section on wiring it further down this page). You'll have a hard time getting a refund if you try to return / exchange it once you've performed this DIY on it. 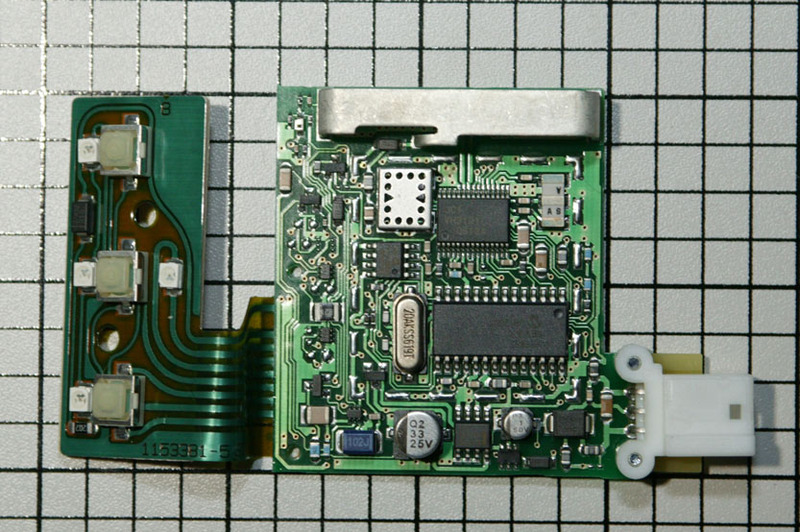 To test it, you will need to program it to work with your garage door. Especially if you purchased a used opener, I'd suggest programming all three buttons to make sure they all work. If you didn't receive instructions with your opener, you can view them on the manufacturer's web site. 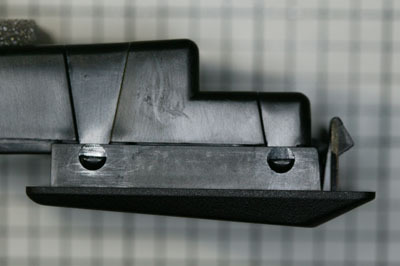 The first thing to do is to take your small flat-blade screwdriver or pick and carefully release the faceplate. Press the two tabs as shown in the left-hand picture and release one side. You should now be able to pivot the faceplate off without needing to press on the tabs on the other side. Note that there may be a manufacturing code sticker on the side which can conceal one of the tabs. 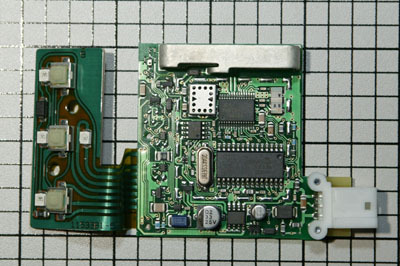 Once you have removed the faceplate, you should have something that looks like the right-hand picture. Next, release the three tabs holding the main clamshell closed. 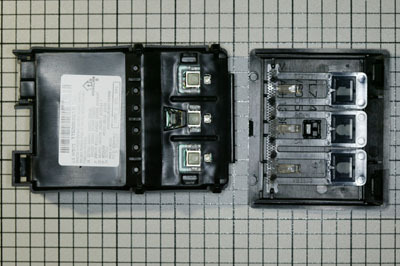 These are located on the edge of the clamshell with the white connector. There is one on either side of the connector, and another larger one on the far edge. Once you have the clamshell open, it should look like this picture. Carefully remove the circuit board assembly from the clamshell. 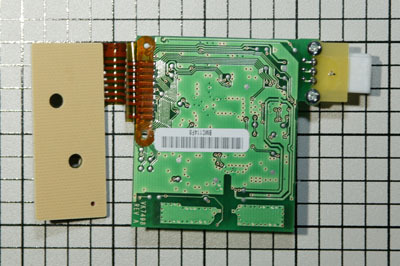 As you can see in the above pictures, the board is in two parts connected by a flexible cable. 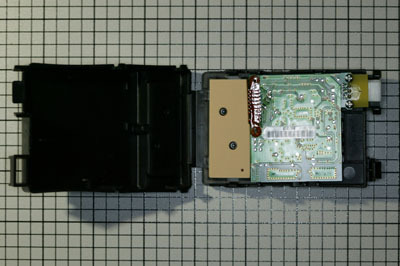 Be particularly careful when removing the button board from the clamshell, as different versions of the opener have different retaining clips. 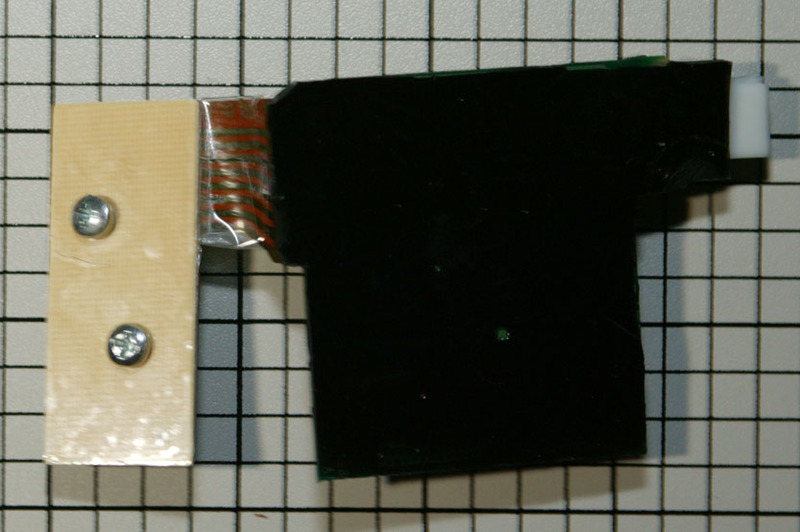 Carefully wrap the button board in clear packing tape, since we don't want to get any epoxy on it at this point in the procedure. Also, wrap the flexible cable with clear packing tape. We use clear tape so we can see if the epoxy gets under the tape, and hopefully correct the problem before the unwanted epoxy cures and ruins the opener. 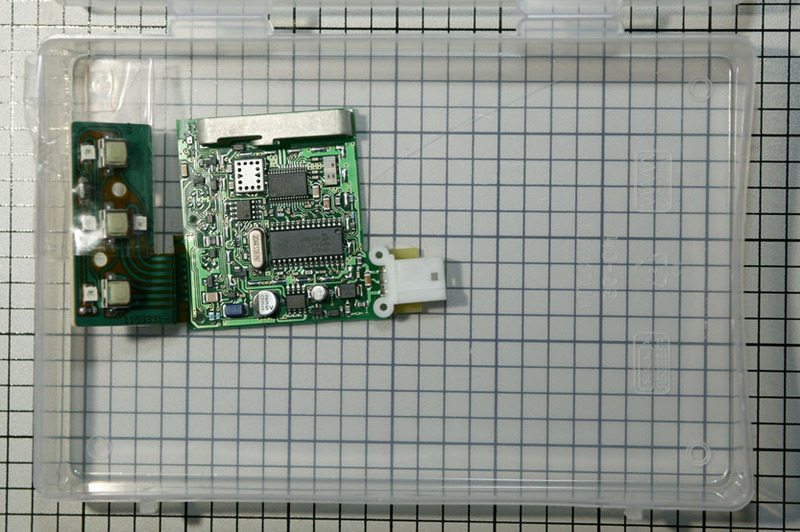 Once you have the button board and cable wrapped, place the whole assembly in the potting tray or plastic container. 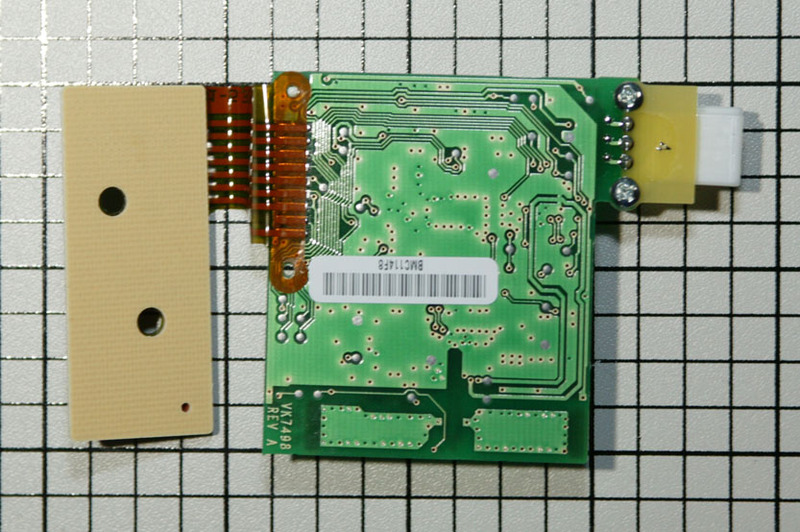 Make sure that the bottom side of the circuit board is level with the bottom of the potting tray. 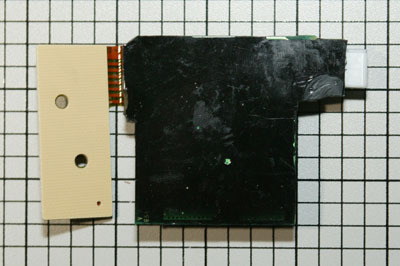 You can use more of the packing tape to hold the button board to the side of the tray if needed to stabilize the main circuit board in position. 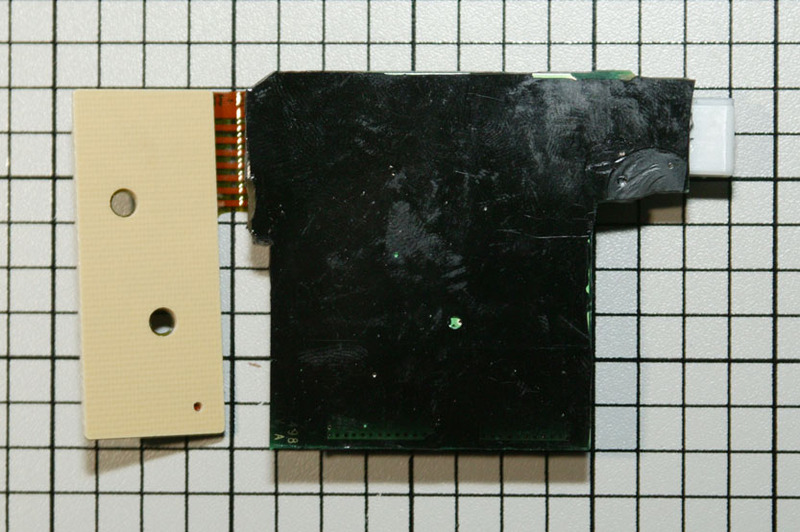 You'll need some way of delivering the epoxy to the board in a relatively controlled manner. 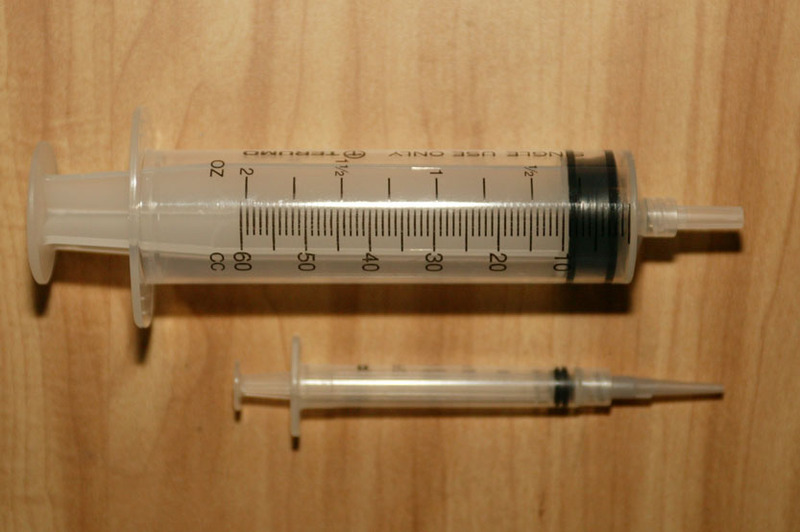 I used the larger of these two syringes for this step. 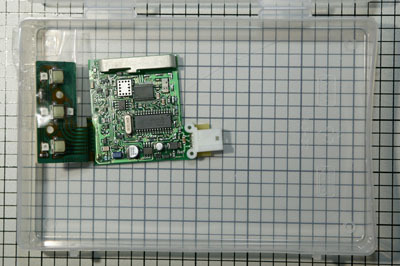 Mix a sufficient quantity of epoxy to cover the circuit board while leaving the tops of the tallest components exposed. 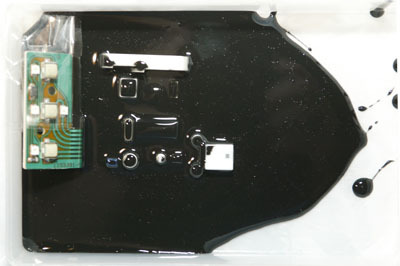 Don't worry about filling the tray - in fact, leaving part of the tray uncovered will let excess epoxy flow off the top of the circuit board. Let the epoxy cure for several hours. You can poke it with a pen or similar instrument to see how the cure is progressing. When it has hardened but it is still somewhat sticky (the consistency of road tar), carefully separate the board with epoxy attached from the potting tray. Assuming you used a potting tray or a polyethylene-based plastic tray, the epoxy should easily separate from the tray. Using your fingers, bend the "ears" of the epoxy that are hanging off the edges of the circuit board, so you are left with a board with sharp edges. Be particularly careful in the area of the flexible cable as you don't want to cause any damage to it. When you are done, you should have something that looks like these two pictures. If you have jagged edges of epoxy, you can carefully trim them with a razor blade or hobby knife. 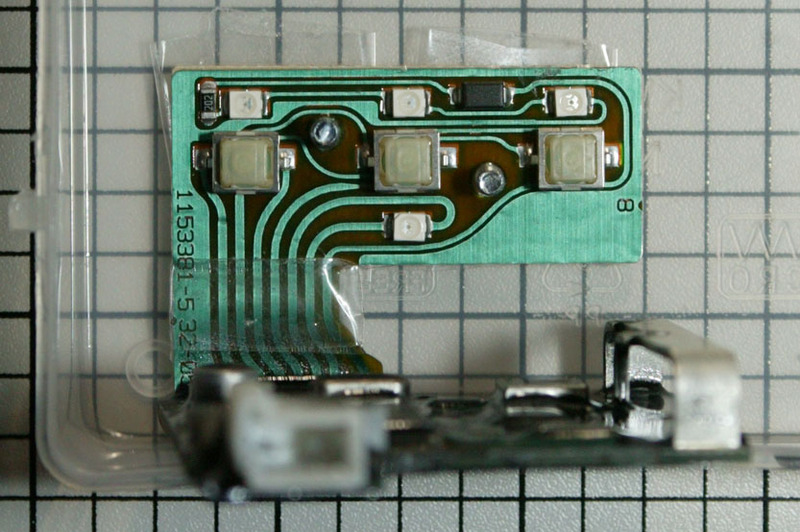 Also, make sure that you didn't get any epoxy inside the white connector (a small amount on the outside is Ok). If there is any epoxy inside the connector, carefully poke it with your small screwdriver or pick to remove it. 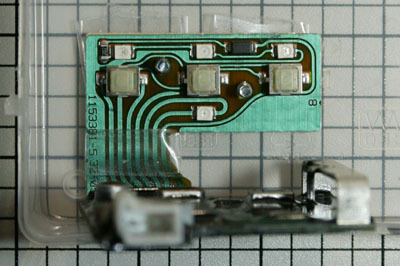 Now, cover the back and edges of the button board with clear packing tape, as we don't want any epoxy getting on there. Inspect the clear tape you put on the flexible cable in the previous step, and add or replace as needed. Next, find 2 screws that will fit in the holes of the button board and screw them in. These are used to keep the epoxy from blocking the holes. Position the board in the potting tray with the button board flat against the bottom of the tray. You can use a loop of packing tape on the bottom to hold it down. VERY CAREFULLY use the small syringe to deposit epoxy on the top of the button board. You don't want to cover the 4 lights or get any on / in the three buttons, or the opener will be ruined. You just want to make a thin "skin" of epoxy on the top of the circuit board, unlike the previous steps where you wanted a good coating on both the top and bottom of the board. Let the epoxy sit and cure undisturbed overnight. 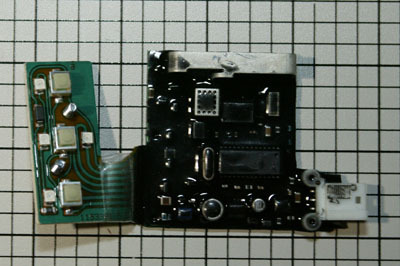 When it is cured, remove the board from the potting tray and remove all of the packing tape from the button board and flexible cable. 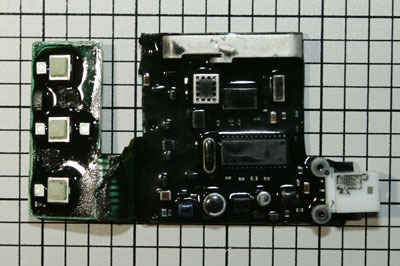 Remove the two screws from the back of the button board to expose the holes. Verify that the buttons still work (there should be an obvious springy point to them when pressed). 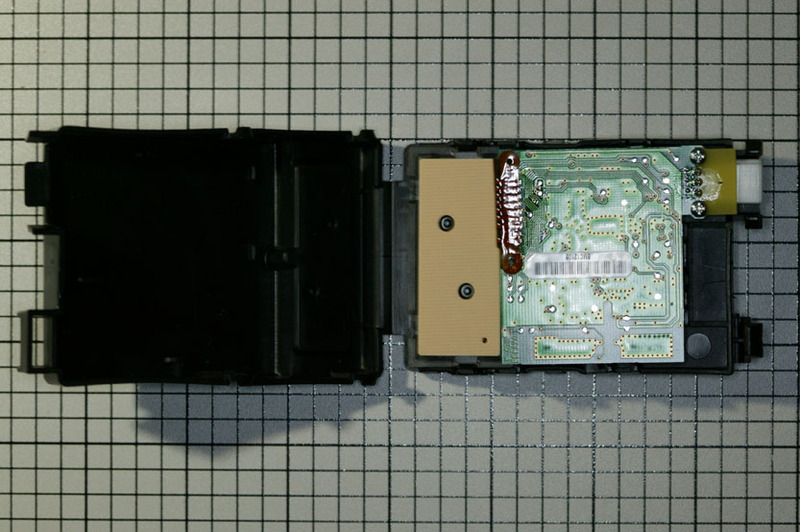 At this point, re-install the circuit boards in the opener clamshell, using the pictures at the top of this article as a guide. Re-install the faceplate on the opener and verify that the buttons operate properly. This might be a good time to test the opener again to make sure it still works. [To be supplied later] Instructions for cutting the center console and wiring the UGDO. Accessibility Policy This page last modified on Tuesday, 02-Jul-2013 07:45:26 EDT. So, what's a glaver anyway? 2 hits this week, 5783 since 1/3/2010.